By applying targeted sanctions against Chinese officials, Canada would send a powerful message to Beijing that it stands firmly for human rights and democratic values, writes Irfan Yar. The Western world likes to profess that it will never again allow draconian regimes to get away with egregious abuses of minority populations … that is, unless China is the perpetrator. The Chinese regime has adopted an oppressive campaign to extinguish the religious and ethnic identity of the Uyghur people, a Muslim minority in the Xinjiang region of China. There is well-documented evidence that Chinese authorities are committing gross human right violations to this group. In fact, factors such as the massive state-sponsored migration of Han Chinese, forced assimilation of the Uyghur population, and systematic economic and social inequalities between Han Chinese and Uyghurs have led to tensions in the resource-rich region. Beijing has exaggerated the nature of these tensions, framing them as a threat to domestic security in Xinjiang. Admittedly, a number of small terrorist groups have committed violent attacks in the region and beyond, such as the East Turkestan Islamic Movement, for example. For China, however, the threat is not rooted solely in these small groups—the perceived threat is the overall Uyghur culture and their religion in general. Chinese authorities accuse Uyghur Muslims of being separatists and terrorists who are seeking to establish an independent state of their own. Over the few several years in particular, the People’s Republic has used these sorts of self-made accusations as a means to further their oppressive program in Xinjiang. Since the hardline party leader, Chen Quanguo, has been transferred from Tibet to Xinjiang in 2016, the Uyghurs have found themselves at the centre of a high-tech security storm. 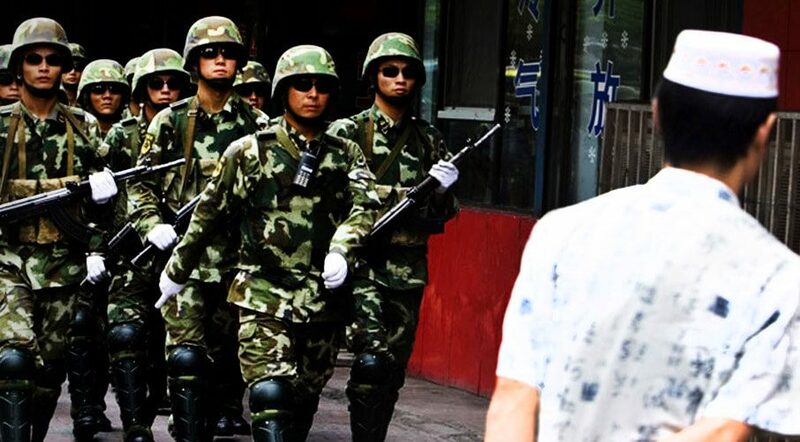 Indeed, Beijing’s response in the region has been heavy-handed, with unprecedented crackdowns that have turned the Uyghur Muslims’ life into a real-life dystopia. New methods of surveillance have been increasingly evident in Xinjiang, ranging from Iris scanners, WIFI-sniffers, facial recognition software, bio-metric data, and more. Such measures could very well be used elsewhere in China, especially given its plans to construct a social credit system by 2020 to monitor and shape each citizens’ behaviour. In the name of combating religious extremism, more than a million Uyghurs have been detained in internment camps where they are forced to undertake “re-education” and indoctrination. Those who are considered to have “problematic ideas” are forced to renounce their religion, chant communist slogans, and propagate a communist identity. The Turkic-speaking minority is not allowed to practice their rituals. Offering prayers, religious education, and fasting is highly restricted or completely banned. Keeping a beard, which can be both a religious practice for Muslims and a personal choice, is also forbidden by the communist regime. In one case, a family of four, including two children, were taken to a political education camp in western Xinjiang simply for traveling to Saudi Arabia to perform Hajj, a pilgrimage to Mecca that is a necessary duty for all Muslims that have the means. Uyghurs are also subject to strict ethnic profiling in their travels at thousands of pedestrian and vehicle checkpoints while Han Chinese are often waved through. The list of measures goes on. Owing to China’s economic advantages, most countries have turned a blind eye to Beijing’s massive state repression of Uyghur Muslims. Notably, while often showing a deep concern for the plight of Muslims in Kashmir and Palestine, many Muslim-majority countries have been largely silent concerning the fate of their co-religionists in China. Canada has often been conspicuously silent when it comes to human rights abuses in China. Yet, when it came to the plight of Muslims in Xinjiang, it is notable that Canada was one of the few countries to openly criticize China’s treatment of its Uyghur minority–even taking the lead in a letter initiative among allied countries to criticize Beijing. But more must be done to fight against China’s brutal and oppressive campaign against the Uyghurs. One possibility is using Canada’s Justice for Victims of Corrupt Foreign Officials Act—also known as the Sergei Magnitsky Law—a legal measure that sanctions foreign individuals involved in human rights crimes. Ottawa has already used this legislation to sanction officials from Venezuela, South Sudan, Saudi Arabia, and Russia. In the face of such an unrelenting repressive campaign, the government should consider applying such targeted sanctions against Chinese officials involved in the detention of Uyghurs in Xinjiang. U.S. lawmakers are currently exploring the possibility of applying such measures in the Uyghur Human Rights Policy Act. By applying targeted sanctions against Chinese officials, Canada would send a powerful message to Beijing that it stands firmly for human rights and democratic values. It would also send an equally important message that Canadian diplomacy is neither suppressed nor hamstrung by China’s unlawful detention of Canadians Michael Kovrig and Michael Spavor. This crude attempt at “hostage diplomacy,” now more than 100 days long, should not stop us from standing up for human rights in China. Irfan Yar is a counterterrorism and foreign affairs analyst, and currently a research intern at the Macdonald-Laurier Institute.